At the back end of 2017, Veeam released the Universal Storage API with Veeam Availability Suite 9.5 update 3. This framework offers built-in integrations with storage systems to help decrease impact on the production environment and significantly improve RPOs. The features this framework unlocks are the ability to reduce the impact of performance on the primary VMware estate when it comes to creating VMware snapshots, offloading this process to the storage array to then taking the backup from the storage. Secondly the ability to use the Veeam Explorer for Storage Snapshots to gain visibility into historic snapshots and still give the ability to perform granular recovery tasks against snapshots not even created by Veeam on the storage array. Thirdly and very important to tightening that recovery point objective is the ability to drive application consistent snapshots on the storage array to provide an option for really fast recovery of data, down to the application item level. Lastly but probably most importantly is the ability to do more with those snapshots that have been created in an application consistent manner, with this integration you will have the ability to leverage this data for many different use cases. One use case of where this functionality could really benefit these businesses is DevOps, the ability to create copies of your production environment in minutes so that your developers can test new features against that production-like data without affecting performance and uptime of the production workloads. All of this whilst using your performant Pure Storage FlashArray features that include thin provisioning, deduplication and compression. Another use case is around modern analytics, the ability to take the production workload and leverage that data so that as end users you can gain insight into your workloads and achieve more with those findings and deliver value for your business without having to worry about the underlying infrastructure and performance. 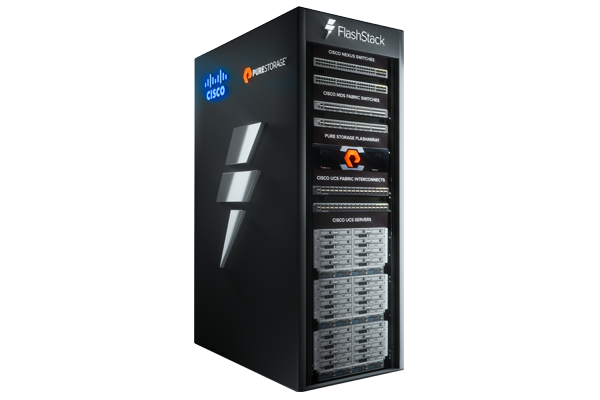 This integration also follows the Pure Storage FlashArray into the converged infrastructure, offering the ability to combine compute, networking, storage and virtualisation. This provides more efficiency, ease of deployment and predictable performance. Reducing management and the need to fine tune these tasks frees up resource to focus on more important tasks within the business. This converged approach can be extended with the use of the “Virtual Data Center in a box” allowing for your remote offices to also benefit from the storage and Availability benefits from Cisco, VMware, Pure Storage and Veeam. The Pure Storage FlashArray integration with Veeam Availability Suite provides backup, recovery, replication and failover capabilities to enhance recovery point objectives and recovery time objectives.